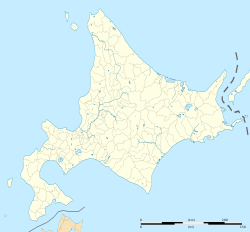 Hokkaido University (北海道大学, Hokkaidō daigaku), or Hokudai (北大), is a Japanese national university in Sapporo, Hokkaido. It is a member of the Imperial Universities, which were established to be the nation's finest institutes of higher education or research. 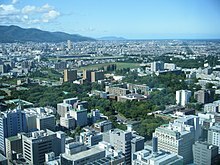 It is located in downtown Sapporo, just north of Sapporo Station, and stretching approximately 2.4 kilometers northward. It is considered one of the top universities in Japan. Hokkaido University (Hokudai for short) was founded in 1876 as Sapporo Agricultural College (札幌農學校, Sapporo nōgakkō) by William S. Clark with the help of five faculty members and a first class size of 24 students. In September 1907, Tohoku Imperial University (東北帝國大學, Tōhoku teikoku daigaku) set up the faculty of Agriculture in Sapporo. Tohoku Imperial University ceded the Faculty of Agriculture to Hokkaido Imperial University (北海道帝國大學, Hokkaidō teikoku daigaku) on April 1, 1918. It was one of nine Imperial Universities. The School of Medicine was established in 1919, at which time the Agricultural College became the Faculty of Agriculture. This was followed by the Faculty of Engineering, the Faculty of Science, and finally in 1947, the Faculty of Law and Literature. The current name of Hokkaido University also came into use in 1947. In 1953, the Graduate School was established. Since 2004 the university has been incorporated as a National University Corporation under a new law which applies to all national universities. Although the incorporation has led to increased financial independence and autonomy, Hokkaido University is still partially controlled by the Japanese Ministry of Education. In 2014 the university was selected under the Super Global Universities program that began as an initiative of Prime Minister Shinzō Abe who stated its aim was to help more of Japan's universities rank in the top 100 worldwide. Under the program, it is listed in the top university category or Type A—(Top Type) The Top Type is for world-class universities that have the potential to be ranked in the top 100 in world university rankings. Each Type A university will receive ¥420 million ($US 4.2 million) annually until 2023. Both international and domestic students may apply for graduate programs taught in English. In addition, the university offers two four year undergraduate degree programs: the Modern Japanese Studies Program (MJSP), and the Integrated Science Program (ISP). These two programs are only available to international students. Competitive scholarships are available for all graduate and undergraduate students enrolled in English degree programs, which range in amount from tuition discounts to full funding. The University's Institute of Seismology and Volcanology was founded in 1998 in collaboration with several seismological observatories around Hokkaido. The institute is represented on the national Coordinating Committee for Earthquake Prediction. In 2016, the university launched the Hokkaido Summer Institute, a three-month-long program from June to August which offers a variety of classes for both undergraduate and graduate students. Guest lecturers are invited from all over the world to share their expertise for the courses, which usually run for 1-2 weeks and grant students a small amount of academic credit. Both Japanese and foreign students participate in this unique program, which is conducted entirely in English. Golden Ginkgo Trees line the street at Hokkaido University in fall. The main Sapporo campus is located just north of Sapporo Station, in the heart of Sapporo City. The entirety of the campus measures approximately 180 hectares, and houses academic and administrative buildings, research laboratories, student dormitories, and farmland. The main academic buildings are found along a 1.5 kilometer stretch of road that runs from the Main Gate to the Kita 18 Gate, roughly encompassing the distance between Kita-Juni-Jo and Kita 18-jo subway stations on the Namboku Subway Line. A campus-wide bus service runs regular routes between the southern and northern end of the university, although access is restricted to university staff only. The abundance of accessible green space has continued to be popular not only among students, but also the general public, who can often be seen using the campus area in a similar way to a public park. Walking tours of the campus for interested foreign and domestic tourists are provided by several businesses in Sapporo, although no tour is needed to visit the campus.Fall is an especially popular time for campus visits, with tourists and Sapporo residents flocking to get a view of the golden ginkgo trees that line Ginkgo Avenue. In order to raise awareness of the university internationally, as of June 2018 Hokkaido University is currently operating eight satellite offices worldwide. After opening its first overseas satellite office in Seoul, South Korea, Hokkaido University has also established satellite offices in Helsinki (Finland), Beijing (China), Lusaka (Zambia), Bandung (Indonesia), Quezon City (Philippines), Kamphaeng Saen (Thailand), and a special China Office in Beijing. Interested parties can not only obtain information regarding the university at these offices, but prospective students can also take university entrance exams there, a procedure which previously was only offered in Japan. Hokkaido University is one of the most prestigious universities in Japan. It can be seen in the several rankings such as shown below. In 2018, QS World University Rankings ranked Hokkaido University at 122th in the world (7th in Japan). In the same year, the Times Higher Education(THE) Japan ranked them 6th in Japan. They ranked as 6th or 7th in Japan in 2017 according to the Academic Ranking of World Universities(ARWU), and between 151st and 200th in the world. Also that year, the CWTS Leiden Ranking ranked them at 120th in the world and 6th in Japan. In 2013, their highest score in QS Ranking was for Faculty Student Score (88 out of 100). Their lowest was for International Faculty Score (13.5 out of 100). In an effort to boost their International Faculty Score, Hokkaido has recently been selected to be part of Japan's Super Global Universities Program. This program provides special funding to hire international faculty. According to Thomson Reuters, Hokkaido is the 6th best research university in Japan. Its research standard is especially high in Materials Science (7th in Japan, 86th in the world), Chemistry (8th in Japan, 52nd in the world), and Biology & Biochemistry (6th in Japan, 104th in the world). Weekly Diamond reported that Hokkaido has the 10th highest research standard in Japan in terms of research funding per researchers in the COE Program. According to the Qs World university rankings　in September 2012, Hokkaido University was placed 135th (worldwide) and 6th (in Japan) for general standards in engineering and technology. It also has a good research standard in Economics, as RePec ranked Hokkaido as the 16th best Economics research university in Jan 2011. The university received attention in 2010 when Professor Akira Suzuki won the Nobel Prize for Chemistry jointly with Richard F. Heck and Ei-ichi Negishi. According to the Weekly Economist's 2010 rankings, undergraduates from Hokkaido have the 49th best employment rate in 400 major companies in Japan. Hokkaido Law School was ranked 6th in 2010 (8th in 2009) in the passing rate of Japanese Bar Examination. Eduniversal ranked Hokkaido as 2nd in the rankings of "Excellent Business Schools nationally strong and/or with continental links " in Japan. Hokkaido is one of the most selective universities in Japan. Its entrance difficulty is usually considered as one of the top in Japan. ^ "Number of Students". Hokkaido University. Retrieved 2018-12-25. ^ Nussbaum, Louis-Frédéric. (2005). "Hokkaido Daigaku" in Japan Encyclopedia, p. 343, p. 343, at Google Books. ^ "Hokkaido University". Archived from the original on 2012-08-06. Retrieved 15 July 2015. ^ "QS Intelligence Unit | Prime Minister Abe to Accelerate Internationalisation of Japanese Universities". www.iu.qs.com. Retrieved 2016-01-16. ^ Maruko, Mami (2014-10-22). "Universities aim to boost their global ranking". The Japan Times Online. ISSN 0447-5763. Retrieved 2016-01-16. ^ "Study in English (Postgraduate Level) | Hokkaido University". global.hokudai.ac.jp. ^ "Hokkaido Summer Institute". Hokkaido Summer Institute. ^ "構内循環バス – 北海道大学施設部" [Circulation bus in the premises - Hokkaido University Facilities Department] (in Japanese). ^ "「北海道大学キャンパスウォーキングツアー」が実施されています！ - 北海道宝島トラベル". 北海道宝島トラベル. ^ "北大イチョウ並木アクセス・営業時間・料金情報 - じゃらんnet" [Hokkaido University Ginkgo bunko Access · Hours · Price Information - Jalan net] (in Japanese). ^ "Training Vessels". Hokkaido University. ^ "Overseas Satellite Offices". Hokkaido University. ^ "Hokkaido University". Retrieved 15 July 2015. ^ "Kawai 30 Top Japanese Universities". Kawaijuku. 2001. Retrieved April 29, 2011. ^ "QS Asian University Rankings". QS Quacquarelli Symonds Limited. 2016. Retrieved September 24, 2017. ^ a b "Academic Ranking of World Universities". Institute of Higher Education, Shanghai Jiao Tong University. 2017. Retrieved September 24, 2017. ^ "QS World University Rankings". QS Quacquarelli Symonds Limited. 2018. Retrieved September 24, 2017. ^ a b "Top 25% Institutions and Economists in Japan, as of January 2011". REPEC. 2011. Retrieved May 11, 2011. ^ "Kawaijuku japanese universities rankings in Engineering field" (in Japanese). Kawaijuku. 2012. Retrieved July 20, 2012. ^ "QS topuniversities world rankings in Engineering field". Topuniversities. 2012. Retrieved July 20, 2012. ^ a b c d e f "Thomson Reuters 10 Top research institutions by subject in Japan" (in Japanese). Thomson Reuters. 2010. Retrieved May 11, 2011. ^ "Architects Registration Exam Successful Applicants rankings" (in Japanese). Shikaku Seek. 2010. Retrieved May 11, 2011. ^ "Times Higher Education Japan 2018". ^ "CWTS Leiden Ranking 2017". ^ "Top 200 QS World University Rankings 2013". the Guardian. Retrieved 15 July 2015. ^ "Universities aim to boost their global ranking". The Japan Times. Retrieved 15 July 2015. ^ "QS world university ranking（2012）". topuniversities.com. Retrieved September 18, 2012. ^ "The Nobel Prize in Chemistry 2010 - Press Release". Retrieved 15 July 2015. ^ "Employment rate in 400 major companies rankings" (in Japanese). Weekly Economist. 2011. Retrieved Apr 29, 2011. ^ Japanese journalist Kiyoshi Shimano ranks Hokkaido's entrance difficulty as SA (most selective/out of 11 scales) in Japan. 危ない大学・消える大学 2012年版 (in Japanese). YELL books. 2011. ^ "三浦雄一郎先生　エベレスト登頂成功、おめでとうございます。". Archived from the original on 18 March 2014. Retrieved 9 June 2013. Wikimedia Commons has media related to Hokkaido University. This page was last edited on 25 December 2018, at 07:12 (UTC).